The most brilliant mind in Compton just dosed up his favorite pet with a growth serum that made it enormous. Now a breakout rap group on the verge of signing their first record deal is South Los Angeles’ only hope for stopping a Snake Outta Compton. A group of Hollywood-for-hire writers team with Hank Braxton and Tim Johnson, known for their fanfic films pitting the Ghostbusters against whatever they find handy, to create the next Syfy channel worthy CGI giant animal monster epic. These CGIsploitation films have their fan base, I am not one of them. 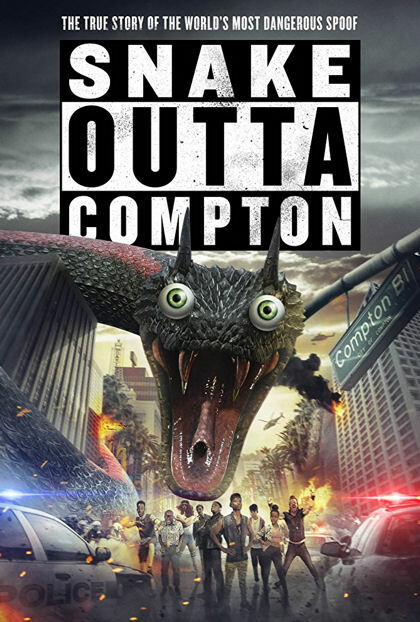 As the name and trailer allude, Snake Outta Compton is a CGI satire of Snakes on a Plane ten years later. It is everything a CGI Syfy original aspires to be. The actors are satire fine, production values of everything not animated are good, the script is as ridiculous as is to be expected from such a film. Even the CGI isn’t the worst budget computer effects I’ve seen, even when Urkel rides the snake. I feel the production team probably got the film they want, and those who love such films will probably enjoy it. This just isn't in any way a type of movie I enjoy.